I think Dr. Murray is probably stressed out to the maximum by now. He was irresponsible to the greatest degree. I do not think he is the only one responsible though. Other Dr.s and inside enablers as well as Michael himself have to bear some responsibility too. Obviously Michael is gone. He paid the ultimate price for his addictions. He was apparently pretty well hooked on drugs and did not seek help to overcome the addiction(s). I know this is not uncommon.The denial and feeling of being in control of it ,is an ever present obstacle to many people who find themselves addicted to drugs. But Dr. Murrays statement didn’t mention Michael at all. I feel from the beginning there was a cover up on his part. The time of death is questionable.His efforts to conceal the fact that Michael was in trouble until noon seems extremely suspect. His attempt to perform CPR on the bed also very suspicious. The list goes on and on. But what stood out as most suspicious to me was that when family members desperately sought answers at the hospital, Dr. Murray was vague and then simply disappeared from sight. Saying only something like ,”Michael didn’t make it”, I don’t even recall him saying I’m sorry for your loss! He was ,in my opinion, behaving as if he knew he was guilty of something. That something was that he knew MJ was dead long before they reached the hospital. He died in the Hombly Hills mansion sometime in the early hrs.Of June 25th. I believe it was not intentional and that Doc Murray may have put Michael down this way before without incident and felt very comfortable in doing so. Unfortunately, this time something went terribly wrong. Without the proper warning equipment ekg machine etc. the Dr. for whatever reason, lost control of the situation and Michael stopped breathing and ultimately went into cardiac arrest. 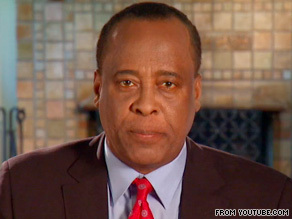 Dr. Murray claims to have given nothing that should have killed Michael that night, but if that is the case ,outside of the propfol, he should have known if MJ was on any other prescriptions or drugs before administering this dangerous drug on top of other drugs.He should also have been monitoring his patient as if he were in the OR, with the right type of equipment and life saving defibrillator paddles . He screwed up and was the only person there that could have saved him. He dropped the ball at some point and as a result Michael Jackson The King of Pop died! Whether he can be held criminally liable or not is a question of intent , I don’t think he intended for this to happen, but somewhere along the line the doctor was negligent. He should have have been able to save him had he been on top of the situation.